Any person or persons or corporate entity that is currently holding, or who may hold, any right or title to real estate in New Mexico, whether it is absolute or limited in possession, remainder, or reversion may convey the property or interest in it subject to the restrictions provided in the New Mexico Statutes (47-1-4). A real estate deed must be in writing, signed by the grantor, and acknowledged by the grantor. In New Mexico, a deed can be in the form of a statutory conveyance, the forms for which are provided in NMSA 47-1-44. The statutory forms are sufficient for their respective purposes and may be altered according to the circumstances of a transaction. The authorization of these forms by statute does not prevent the use of other forms. Commonly used forms in this state are the warranty deed and special warranty deed, either for joint tenants or individuals. In this state, citizens of lawful age and corporate entities that are legally capable of holding property are able to acquire and convey title to real property or interest to real property. More so, in New Mexico, aliens shall have the full power and authority to acquire or hold real property and personal property by deed, will, inheritance, or otherwise. Further, aliens have full power and authority to alienate, assign, sell, and transfer any property to their heirs or other persons, whether the heirs or other persons are or are not U.S. citizens (45-2-111). The grantee to a real estate deed must have the legal capacity to receive property. The type of ownership will determine the owner's rights and manner of conveyance. A conveyance of real estate should be subscribed by the person transferring the title or interest in said real estate, or subscribed by his legal agent or attorney (47-1-5). The person transferring the title or interest is known as the grantor. Witnesses are not required in order to record a real estate deed in this state. Any instrument of writing that has been duly acknowledged is entitled to be filed and recorded. In this case "acknowledged" means notarized by a person empowered to perform notarial acts pursuant to the Notary Public Act or the Uniform Law on Notarial Acts (14-8-4). 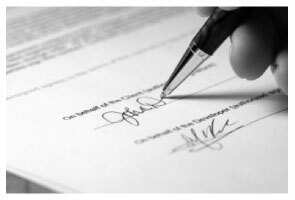 A notarial act in New Mexico should be evidenced by a certificate signed and dated by a notarial officer, which is included on the deed or attached to it. The certificate should include identification of the jurisdiction in which the notarial act is performed and the title of the office of the notarial officer and may also include the official stamp or seal of office. A certificate of a notarial act will be sufficient if it meets the requirements of 14-4-7 of the New Mexico Annotated Statutes. In order to provide notice to all the word of the existence and the contents of a real estate deed, recording must take place. A real estate deed must be recorded in the office of the county clerk in the county where the property is situated. Constructive notice is considered to have been given once a document is acknowledged and recorded in the proper county (14-9-2). No deed, mortgage, or other instrument in writing that is not recorded will affect the title or rights to, in any real estate, of any purchaser, mortgagee in good faith, or judgment lien creditor, without knowledge of the existence of such unrecorded instruments. However, an unrecorded instrument is valid between the parties bound by it. Possession alone based on an unrecorded executory real estate contract will not be construed against any subsequent purchaser, mortgagee in good faith, or judgment lien creditor, either to impute knowledge of or to impose the duty to inquire about the possession or the provisions of the instruments (14-9-3). Tanya D. said: No review provided.